Looking for an escape from Dotonbori's relentless crowds? 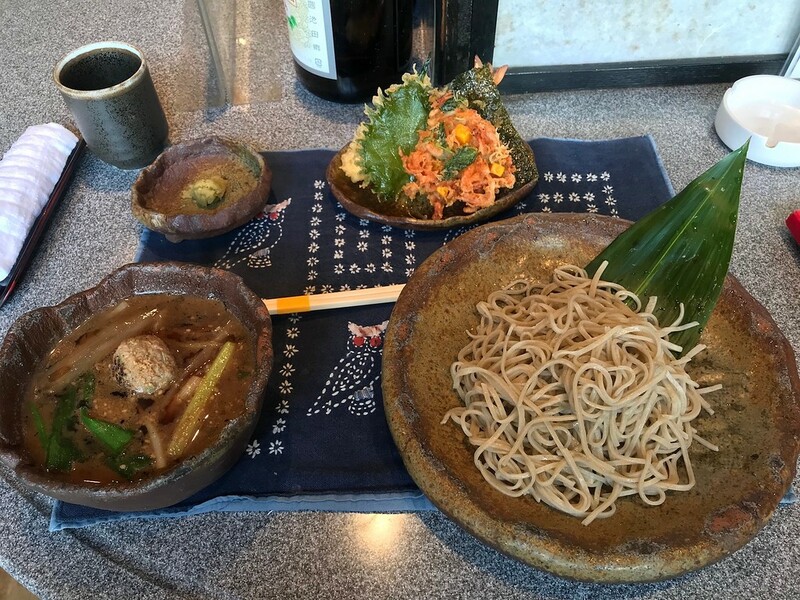 Akari is a charming, homey soba shop will whisk you away to a calmer, quieter world - along with some delicious soba and tempura to boot. Dotonbori is on the top on the list of every Osaka to-visit list in existence. I'm afraid I cannot understand why. Then again, I live here. I am not here to stock up on cheap gewgaws and face masks at Donki Hote. I am here to eat. Luckily, for all its obnoxious tourist trappings, there is good eating to be had in the surrounding area. Teuchi Soba Akari - henceforth Akari - is a small, homey soba restaurant run by an elderly couple. 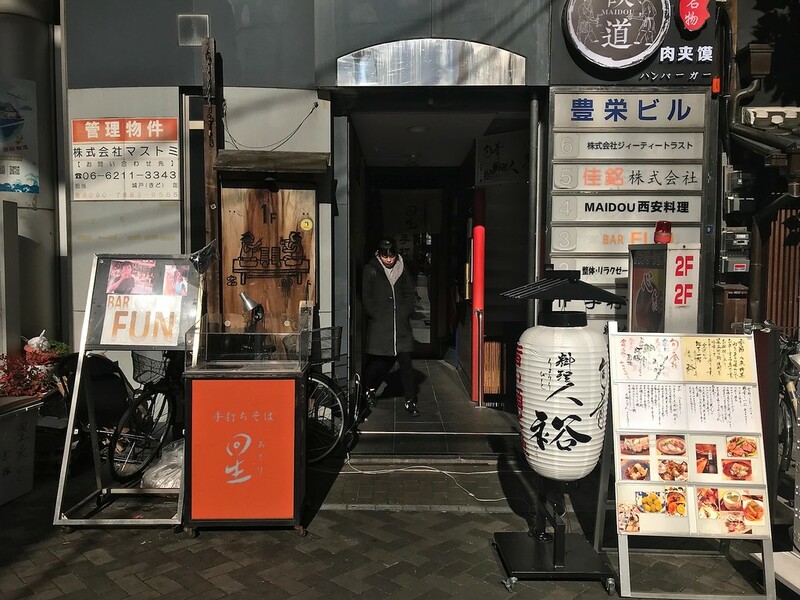 Miraculously enough, it is located on Dotonbori itself, a few dozen meters away from the concentration of action and stimulation. Akari is a miraculous respite from the city. The scent of sizzling sesame oil envelopes you as you walk in, the bell tinkling as the door swings shut behind you. Jazz sets the tone. The music veers from slow-burning tunes to piano jazz to Ella Fitzgerald crooning into an old microphone. I didn't realise just how exhausted a few days in Osaka had left me until I sat down here. The kindly, tiny old woman, whose body is bent into the shape of the く character, will take your order. If your camera is out, she may warn you not to photograph the interior of the restaurant where there are customers - just your food. She does smile while saying this. You will just have to use your imagination a little more and trust me when I suggest that you might like this place. It doesn't matter which restaurant you're at - soba is unequivocally better cold. 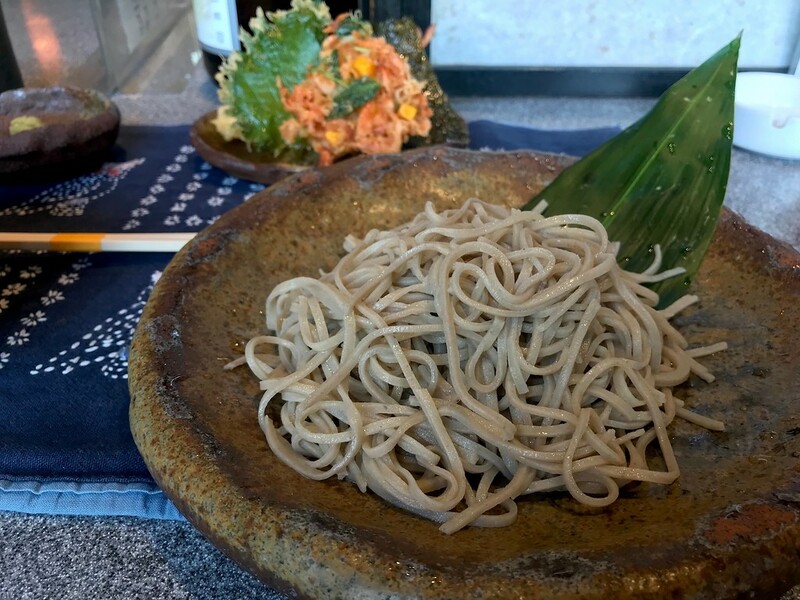 No one likes limp, soggy noodles, which is what happens when you eat hot soba too slowly. Akari's soba could have been rinsed a little bit more to remove the last slick of starch clinging to the noodles but I'm not complaining. 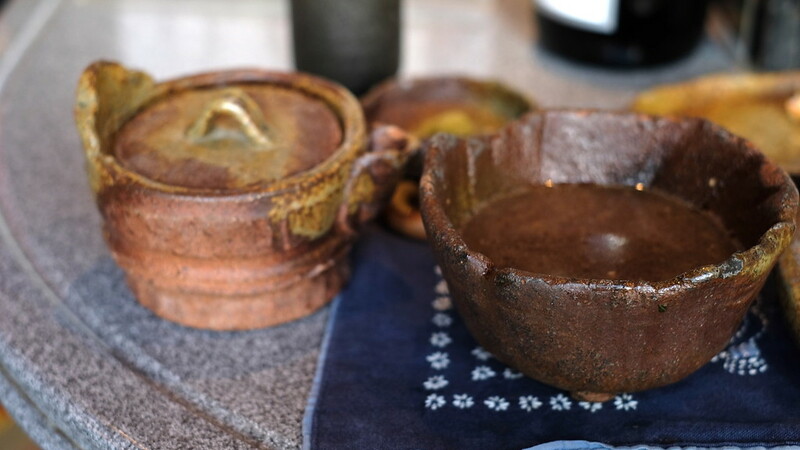 You could order tenzaru (cold soba with tempura), or kamo-jiru (duck broth) soba. Why not have the best of both worlds? You might only be here once. You know the drill - the seasons dictate much eating in this country, so even the fritters here will change with the seasons. 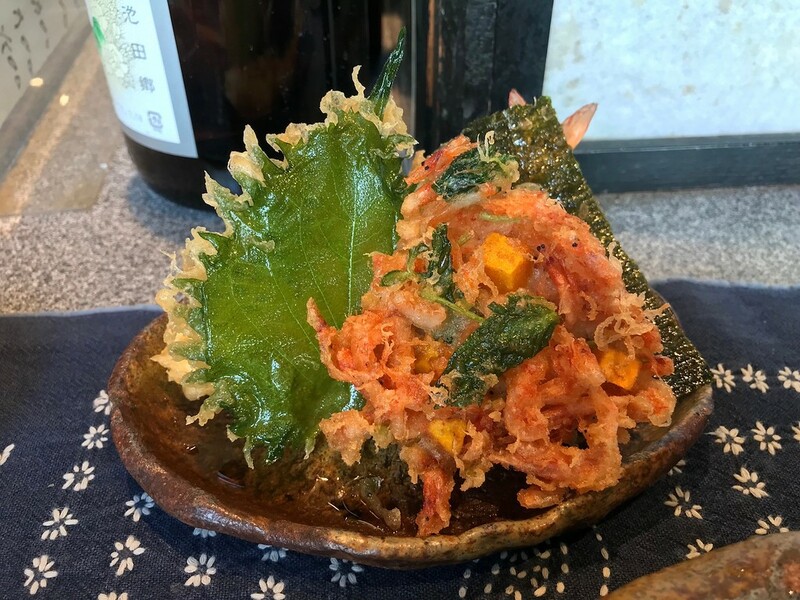 Today it is a late autumn version of cherry blossom prawns and pumpkin, a fusion of ocean and land that tastes like a fluffy, greasy little pillow from the sea. It tastes even better when you dip it in the duck broth instead of the accompanying yuzu pepper paste. It is rather rustic, much like the plate it sits on. If you wanted to be romantic about it you could imagine your Japanese grandparents making you lunch. That's not far from the reality here. 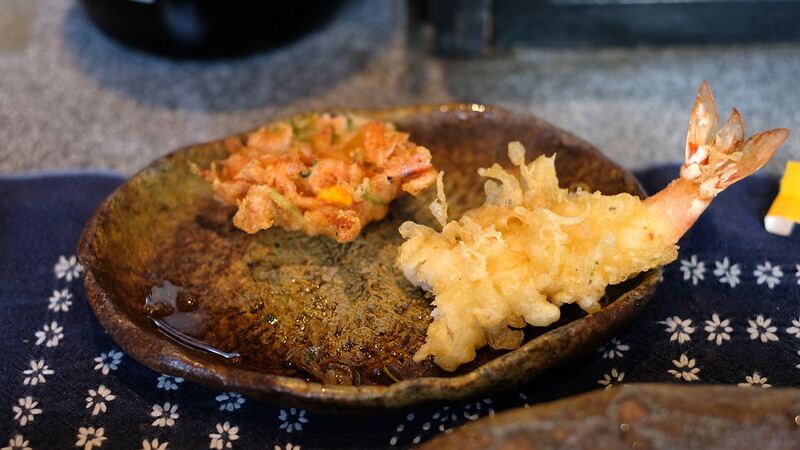 The tempura batter is crispy but a touch too oily, and that is pretty homey as far as I'm concerned. The duck broth is the star here. It is a concentrated noodle dipping broth, essence of soy and meat and alliums to dredge your noodles in. It is distinctly salty. Dip noodles in and slurp straight from the bowl. If you have never liked leek before, you will now. 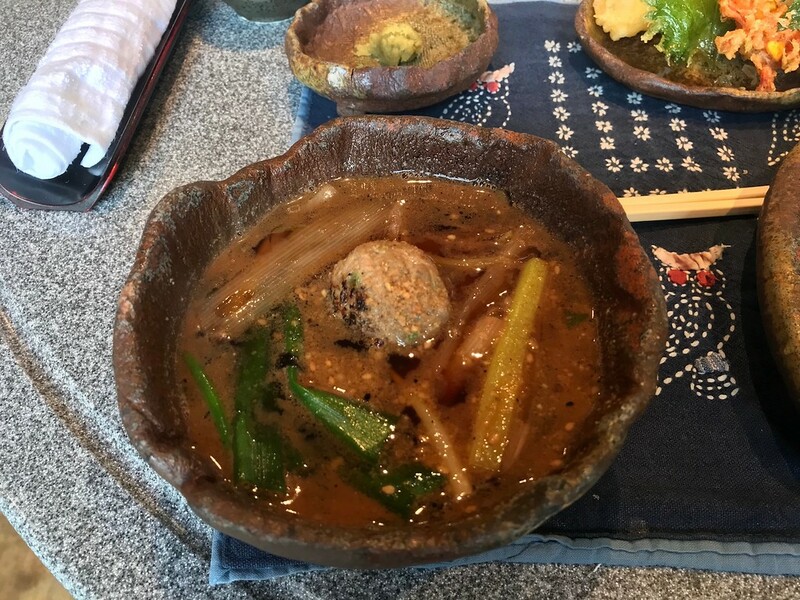 When you're done, pour in the soba-yu from the vessel alongside - hot, starchy soba water to dilute the sauce and make a glorious hot soup to finish your meal here. For all that it feels like it's been here longer than I've been alive, Akari has only been open for 11 years. It is a quiet, restful place out of time. The food is just right for the surroundings. Many come here with newspapers - what wonderful relics in this day and age! Or they are here in pairs, beautiful and quiet couples picking at each other's orders. You could eat here alone, seated at the counter with your back to the river, sunlight shining on the pages of your book. Make the soba last before you venture out into the frenzied masses of urban Osaka again. Directions: Take Exit 2 of Nippombashi Station on the Kintetsu Line or Sakaisuji Line. When above ground, walk straight. You'll be walking alongside a large road on your right, and you'll pass a Matsuya and 7-11 on your left. When you see a traffic light, turn left into Dotonbori. 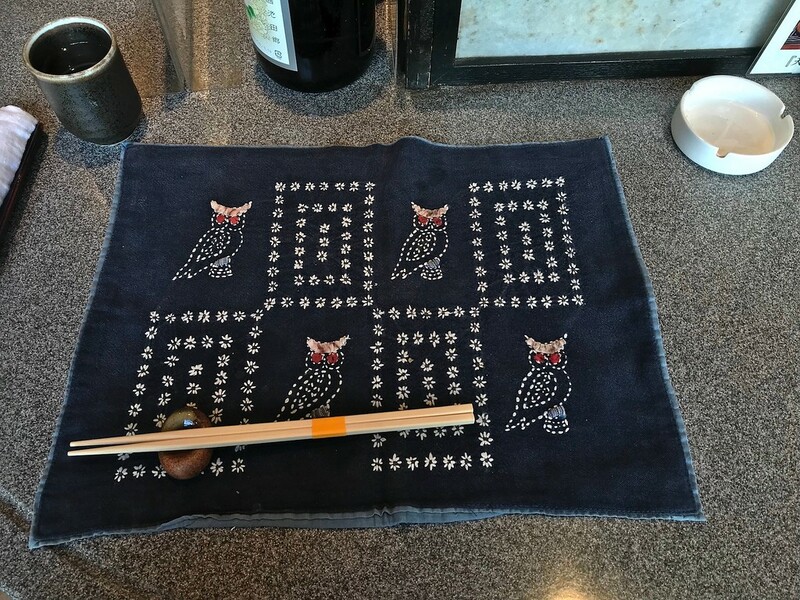 Akari Soba is a few doors down on your right. 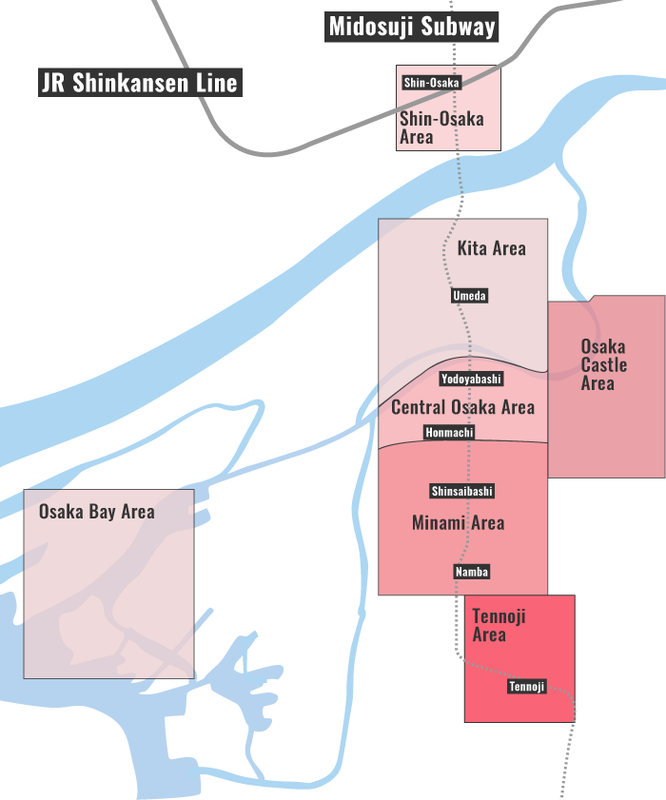 See all recommended places to eat in Osaka where you can mingle with the locals.